21…. The birthday I have been dreaming of my entire life! Now.. where do I celebrate!? I know most people’s dream destination for their 21st is most likely Las Vegas BUT I’m a Las Vegas native and have been to the clubs thousands of times (thanks again to my sister Brie for the ID all those years)! Born from a french family, I have been drinking wine since I could hold a wine glass! So what better way to spend my 21st birthday then in wine country? Picture This: You walk into a charming winery just to be greeted by the wine maker themselves, you sit down on a patio overlooking vineyards on miles of rolling hills, you drink an ice-cold glass of chardonnay while the warm California sun shines on your face… ahhh, perfection. Now if that doesn’t convince you…. Napa Valley is located in northern California just north of San Francisco. You can fly into either Oakland or San Francisco airport, but Oakland is much easier to get to Napa because it is a lot closer! Depending on where you are coming from, San Francisco is usually cheaper to fly into, but then you have to worry about coordinating a ferry and then driving up the remainder of the way! I decided to limit the hassle as much as possible and fly directly into Oakland. Then I got an Uber/Lyft up to Downtown Napa. Trying to find the best area in Napa to stay can be seriously mind-boggling! It took me a long time to reach my decision to stay in Downtown Napa and I’m so glad I did! You can check out my post on Where to Stay in Napa if you are still deciding. My lovely boyfriend of 5+ years, Joseph, came with me to celebrate & we stayed at The Embassy Suites. It was the perfect distance from all the restaurants and shops downtown! We walked around town and checked out a couple of wine bars (wineries that have a shop downtown just for tastings) before going to dinner. Joseph took me out for my Birthday dinner at Allegria – and WOW was it yummy! Napa has always been known for amazing wine but in the past couple years it has been becoming more known for amazing food too! My oh-so-sweet parents surprised me and Joseph with our own personal driver for my birthday gift! They were even so thoughtful to ask for my itinerary and they sent it to the driver so everything would be ready to go when we got there. I got dolled up in my all white dress – I know what you’re thinking… risky to wear white to go wine tasting but hey, I think this dress was worth the risk! 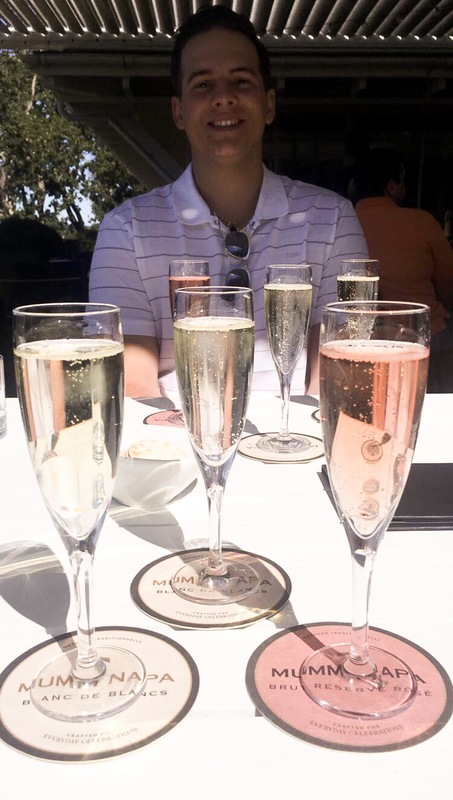 We started with champagne at Mumm Napa! You can reserve a spot on their beautiful patio for a tasting of three different types of champagne for only $25 / person. I’ve been told that the winery tour is very impressive but we decided to skip it and just enjoy the view from the patio. TIP: They also have a gallery that you can walk through for FREE! Our second stop was V. Sattui. We did a tasting here as well but what they are really known for is their incredible lunch and picnic grounds! This winery is a must stop for lunch! We started with the wine tasting for only $20 per person and then grabbed lunch and sat outside under the beautiful picnic grounds. TIP: If you tell everyone it’s your birthday, you will get at least 2 extra “birthday” tastings! Let’s just say the last winery was a little blurry, ha! My favorite chardonnay wine is Rombauer! If you are into buttery, delicious chardonnay, this is the place to be! We did a tasting for only $25/person and walked around the beautiful picnic gardens. TIP: I would grab V. Sattui lunch to go and eat it here instead! The picnic grounds are even prettier and far less crowded. I didn’t know this until after we got there but Castello Di Amorosa is the same winery that owns V. Sattui. So the wine you taste is very similar, if not the same! It was a little bit of a bummer, but the real reason I wanted to visit this winery was the beautiful grounds. We did a castle tour and tasting for only $45/person where they give you premium wine, chocolate, a tour of the castle, and let you taste wine right out of the barrel! This place was VERY crowded especially at the time of day we went. If you are going to pick between V. Sattui and Castello Di Amorosa, I would recommend V. Sattui! We ended the night with some local Thai food and talking about our day in the beautiful courtyard in the hotel! Seriously – this place had a pond…. with geese! Napa, I will be back!